Hope everyone is having a fabulous holiday! It's been very busy around these parts, but I did manage to make my Mom a Christmas present; this glamorous robe! 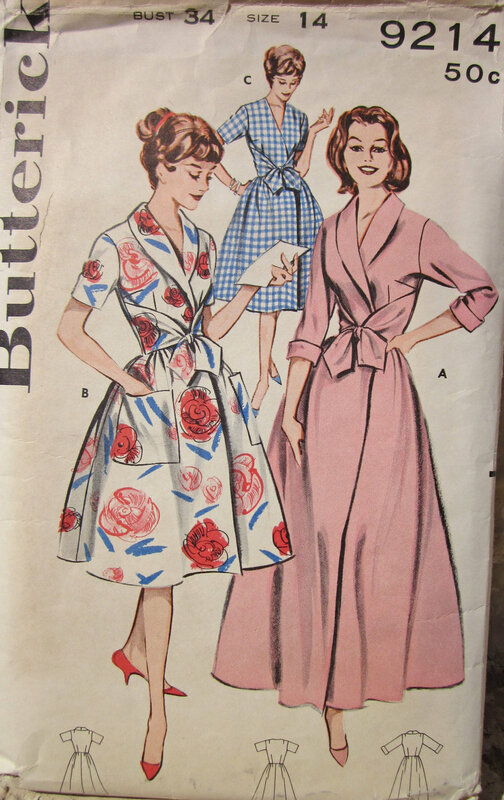 The pattern is Butterick 9214 from 1959. I have been searching for this pattern of a little while, I love the elegance of it. I especially like how the ties are attached at the side seams. The fabric is an off white velour from JoAnn's, which worked out well and has a nice drape for the robe. This project came together rather quickly, it was very easy to follow. My fabric was too thick to gather it at the waist as instructed, so I made pleats instead. I also had to draft a pattern piece for the back facing, and I still finished it just in time for Christmas Eve! I used bias trim for the seam finishing, in a contrasting red color. It makes for a very festive interior! Obviously my Mom loves it, she feels very chic in it. Its very important to be glamorous while lounging on the couch. We had fun taking pictures with my marabou feather slippers and her crystal champagne glass, this robe requires a cocktail. Christmas Craft week continues! This is a super easy one, and there is still time left before Christmas to do it. It would really work for any type of holiday party. I first saw this idea on pinterest, hang a tree branch above your dinner table, and hang ornaments off of it. I took it a step further and spray painted the branch. This branch was just lying in the street, hoping to be part of my Christmas dinner. First I hit with Krylon indoor outdoor paint in Blue Ocean Breeze (leftover from the reindeer), and finished it with Krylon Glitter Blast in Silver Flash. GLITTER BLAST! What could be better? I never knew this product existed, such a life changer. I am going to glitter blast everything, I got both krylon products at Michael's. The glitter blast gave the branch a beautiful luster. I then hung it from the light fixture using fishing string, and the ornaments were scattered down the branch. It looks magical in person, it really brings some whimsy to the dinner table. I am having 11 people here on Christmas! The ornaments and branch just so happen to match my China! Its very dreamy, I just hope the cat doesn't discover it, it's like a floating cat toy! My husband and I needed new Christmas stockings, I wanted something fun, and a little bit different. These stocking kits from Ann Norling were perfect. I like the fun design and the off-beat colors. The pattern was thorough, and had some smart details. The picot edge seam, the reinforced heal, and the sewn in lining. It also says exactly what parts you should use duplicate stitch with, and that makes it a cleaner knit. It also keeps me from cheating and trying to knit in the smaller details, instead of duplicate stitching them later. The sewn in lining is the best part, it acts as interfacing for the whole stocking, and protects the pattern. I used a knit fabric, which still allows for some stretch for oddly shaped presents. I really like to jam the stocking full of goodies. After finishing the whole stocking, seaming it together, and blocking it, I traced the outline of the stocking on my knit fabric, and then added 1/2 inch seam allowance. Sewed it together on the tracing line (don't forget to use a stretch needle! ), hemmed the top and then slip stitched it below the picot hem of the stocking. This is my third year in row knitting stockings, see my others here and here﻿. These are definitely my favorites, he reindeer is just too cute! What do you think, have you ever knitted a stocking? Which one is your favorite? For the second day of Christmas Craft Week, I up-cycled a sad looking reindeer. He used to be covered in lights, and displayed on my parent's lawn for many holiday seasons. Unfortunately he started to look a little tired and was retired to the attic. I found him and decided to make him over. Here he is before-ish. I already took the lights off, but the poor guy couldn't even stand. I bought some dowels and stuck them in his legs for support. Then I spray painted him blue. Why blue? Why not! I was also thinking of pink, or even boring white but blue won out. It took almost 3 cans of spray paint to get him to be a solid blue. I added a fun bow and a spotlight at night. He's not perfect, but he has some personality! On the first day of Christmas craft week, I bring to you... a spool garland for your lovely tree. Last year my Mom gave me a spool garland from Modcloth, I really liked it and wanted more for my tree. I saved up a scrap from each project I made this year. I kept a little cup by the sewing machine, and put a scrap in after each project was done. Now I have a spool to remember everything I made. I like my tree to have a lot of colorful, crazy stuff on it, some may even call it gaudy. This was so easy to do, and the materials were really cheap! I got 50 wooden spools from eBay, some mixed wooden beads from Michael's, and some twine. Cut the fabric scrap to the width of the spool, dab a dot of hot glue, and wrap the scrap around the spool, glue again. Then I just made a loop at the end of the twine, strung the beads, then the spool, etc. It couldn't have been more easy! I even added some yarn from things I knitted this year. Here is my crazy tree! This coming week will be Christmas craft week here on the blog. I have been feeling very inspired this holiday season, and can't wait to share some projects with you!